IWM rose by 0.8% this week; my account rose 0.3%. The loss-floor has risen to -4.1%. I did not feel like doing daily updates this week, so the following “% gain” table is fragmentary. As is the usual case for these things, there were three small gains and three small losses, which sum up to exactly zero, plus one big gain of +1.7% which is my net profit. Of course, it would be better if the chaff trades could have been skipped — but there is no way to know when placing the trades which one is going to be the winner. 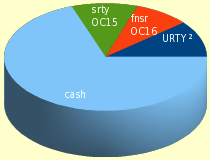 The trade currently in progress (named URTY ² in the table above) is not shown here, but it was purchased just after the gap-up on OC 10 so things are looking good so far.